Hardly a day goes by when someone doesn’t ask him when the walking trail at Veterans Park will be completed, Oconee County Parks and Recreation Department Director John Gentry told the Board of Commissioners at its meeting on Nov. 6. That trail now dead ends abruptly behind the soccer fields on the eastern side of the popular park on Hog Mountain Road west of Butler’s Crossing. Late last week, following approval by the BOC at that Nov. 6 meeting, Gentry submitted an application for $68,000 in federal funds that would allow him to complete the trail when the monies become available in Fiscal Year 2014, which begins on July 1 of next year. 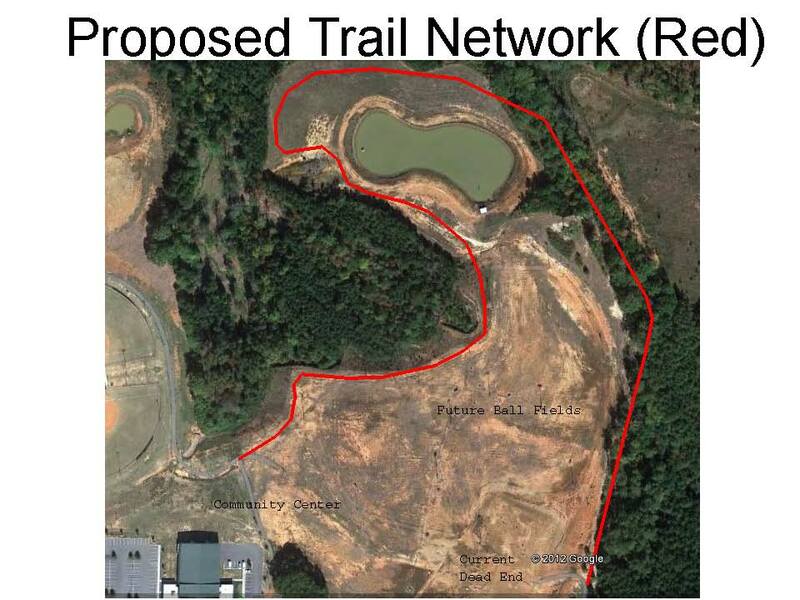 The plan is to add about three-quarters of a mile to the existing trail that circles much of the park. The 9-foot wide paved path would extend beyond and circle the proposed site for baseball fields and then return to meet the current trail north of the Community Center. 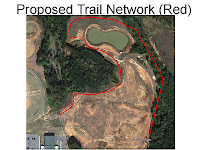 The county applied to the Georgia Department of Natural Resources for the project as part of the Georgia Recreational Trails Program. All of the funds are federal, a spokesman for the Department told me a few days after Gentry’s presentation. The county must contribute $17,000 as a match for those federal funds. The BOC agreed to take those monies from the Special Purpose Local Options Sales Tax account approved by voters in 2009. The DNR is scheduled to inform the county in March if it has been successful with its application. In his application to the DNR, Gentry estimated that work on the project could begin in September of 2013 and be completed in 60 days after it is started. Gentry told the DNR that the current trails dead ends in part because of a lack of funding for its extension. The new trail will add to the existing 1.8 miles of paved trail, making a complete paved trail of 2.5 miles. While the trail extension is part of the master plan for Veterans Park, Gentry told the BOC that the design he now proposes is a modification of the original plan. The original plan was to have the trail follow wetlands in the park that were restored as part of the mitigation for the construction of the proposed Hard Labor Creek Reservoir in Walton County. Oconee and Walton counties are partners in that project. As a condition of that restoration, the trail must be moved out of the mitigation zone, Gentry said. Following the unanimous vote by the commissioners on Nov. 6, Gentry said he was speaking for walkers, bikers and “baby stroller pushers” in the county in offering his statement of thanks for the vote. The U.S. Congress first authorized the Recreational Trails Program in 1991. The most recent reauthorization was passed by Congress in 2012. The funds come from the motor fuel excise tax collected from nonhighway recreational fuel use. Included is the tax on fuel used for off-highway recreation by snowmobiles, all-terrain vehicles, off-highway motorcycles, and off-highway light trucks. The U.S. Department of Transportation manages the Recreation Trails Program through the Federal Highway Administration. The Department of Natural Resources is reimbursed by the federal government for administrative costs for the program. The full video of Gentry’s presentation to the BOC is below. Included is a view of the maps for the project. Is the $17,000, matching funds in addition to the $68,000. in Federal funds? I hope not. As it is, $68,000. seems like a princely sum to pay for 7/10 of a mile in asphalt. My driveway is 5/10 of a mile and only cost $26,000. I hope they are getting more than one estimate. Total cost of the project is $85,000. According to the proposal, clearing, grubbing and grading will cost $27,000, and setup and paving will cost $58,000. This is for hotmix asphalt at $14,50 per square yard.